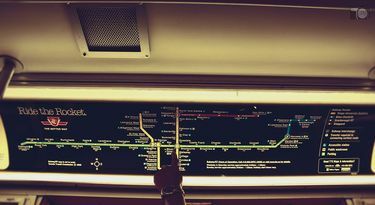 The Toronto Subway and RT (Rapid Transit) system, consisting of 4 subway lines and one elevated rapid transit line forms the heart of Toronto's public transit system. 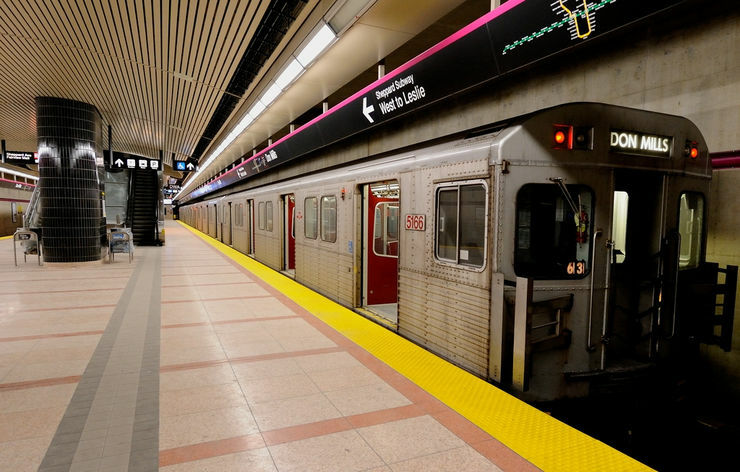 The TTC subway and RT system consists of 75 stations located along 77 kilometres of track. During weekdays the system carries over 1 million passengers daily. Trains are referred to as the TTC Rocket or simply the Rocket. 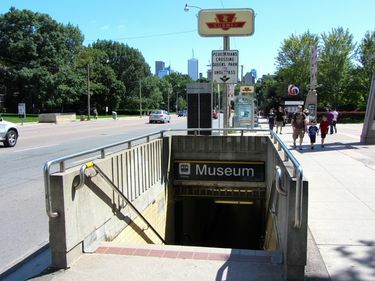 Most of the popular attractions in Toronto are just a short walk from a subway station. For those a little further away you can transfer to a TTC Streetcar or Bus to complete your trip. Looking at a Toronto Subway map, you will see that Line 1, Yonge-University-Spadina, forms a long 'U' shape with Union Station located at the base. With the new extension that opened in December 2017, the western leg extends north to the city of Vaughan. The eastern portion travels north to Finch Station. This line is designated as line 1. 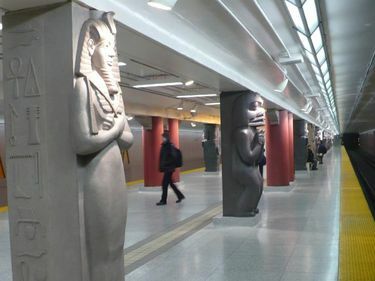 Line 2, the Bloor-Danforth Line, runs predominately west to east between Kippling Station in the West and Kennedy Station in the East. This line crosses both legs of the Yonge-University-Spadina line and has connections to it at Spadina, St. George and Bloor-Yonge stations. Line 3, the Scarborough RT, is an above grade and elevated rapid transit line that continues north and east from Kennedy Station at the eastern end of the Bloor-Danforth Line to Scarborough Town Centre and McCowan Station. Line 4, the Sheppard Line, runs east from Sheppard/Yonge Station on the Yonge-University-Spadina line to Don Mills Station. 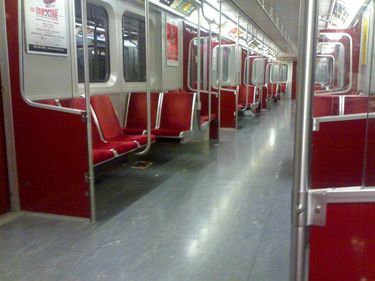 Subway Trains run every 2-3 minutes during rush hour and every 4-5 minutes the rest of the day on both the Yonge-University-Spadina and the Bloor-Danforth Line. Service on the Sheppard Line and the Scarborough RT is between 4 - 6 minutes throughout the day. The system operates between approximately 6 am and 1:30 am Monday through Saturday and 9 am until 1:30 am on Sundays. Transfers valid for trips in one direction are available free from transfer terminals at subway stations. These allow you to continue your trip on a TTC bus or streetcar. Currently, 34 Toronto Subway stations, including all 5 stations on the Sheppard Line are wheelchair and scooter accessible. Elevators provide access at accessible stations. About 50% of trains (identified with a blue wheelchair symbol) have special wheelchair positions, however, any train may be boarded by someone in a wheelchair or scooter. The official TTC site has a complete list of the accessible TTC subway stations and they are indicated by wheelchair symbols on the Toronto Subway system diagram below. For information on how and where to purchase a Toronto Subway Fare please refer to our page on transit fares. If you would like more information, maps and schedules for the TTC Subway and Rapid Transit System please visit the official TTC website. This map combines the best of both worlds — a schematic SkyTrain Map AND clickable stations that open a street map of the surrounding area. Click or tap any station to see a map of the surrounding area and streets. Open the following Toronto Toronto Subway Map overlaid on Google Maps to visualize the Toronto Subway lines in relation to the overall city and attractions. Subway Map inside a Toronto subway car cc licensed photo by mayeesherr.